Classic Backgammon Sets - Our Classic Backgammon Set has a traditional design. The exterior of the case features rounded corners and brass hardware, and the interior has a felt playing field. 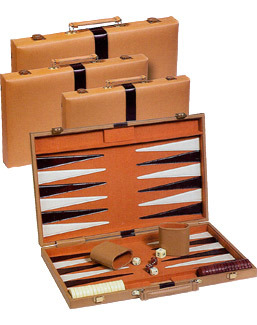 This set comes complete with everything you need for play, including, cups, dice, and checkers. Two sizes: 11" x 8" (#1521) and 15" x 10" (#1523). #1521 Sale Price: $13.65. Was $19.50. Save 30%! #1523 Sale Price: $18.90. Was $27.00. Save 30%!